Brutalism in London. Photo by ben patio. Conventional wisdom on urban history states a few things exceedingly clearly. Perhaps the most axiomatic belief about cities is that brutalist architecture is not only ugly but thoroughly destructive. Boston’s City Hall Plaza is perhaps the most loathed example in the United States, though there are plenty of hated Brutalist buildings right here in D.C. Besides calling Brutalism ugly, I think that the most common complaint about it is that it is inhuman. “the car is no longer ‘progressive’. In any sensible society it would be all but obsolete, a privatised mode of motion which not only carries rates of death in its wake that would never be accepted on any other kind of transport, but which carries in its train a landscape of endless sheds, retail parks and malls which, for all its cold fascination, is not one which even its defenders can be bothered to make a serious case for. It’s an argument that might just be crazy enough to be right. 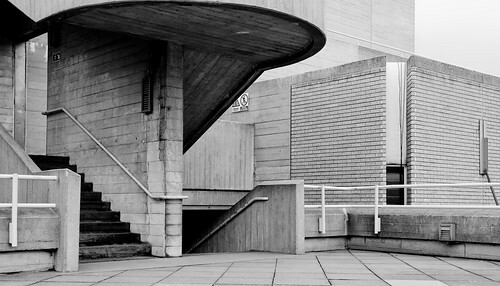 Pedestrian space on the Brutalist Royal National Theater in London. Photo by bbodien. 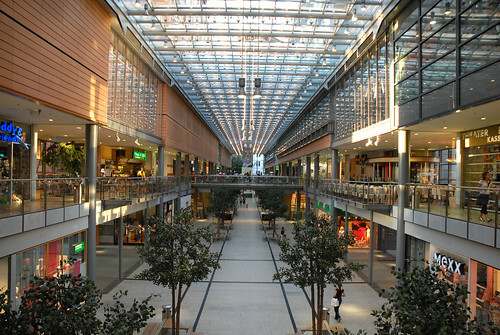 At the center of Berlin, Potsdamer Plotz’s private mall. Photo by Dalbera. The juxtaposition reveals something connected about the two (and by the way, you must read the whole things). Both still believe that architecture can successfully create public life. If you build a walkway, pedestrians will use it. If you build a plaza, crowds will flirt. While Heathcote might protest that the Brutalists were too enamored with modernist vision of control, while he supports the unpredictability of urbanism, both his goal—public life—and his mechanism to achieve it—unprogrammed public space—are the same. In their heterodoxy, these two articles are surprising. But in their presence, they are not. They are obvious responses to the current vogue in planning: New Urbanism, just-plain urbanism, traditional neighborhood design and all the related movements calling for human-scale, street-level, privatized space ( I’ll sloppily call these all New Urbanism for the time being, though it’s in many ways an unfair slur). When all the best planning of today calls for walking along a fine-grained, mixed-use street, there will be a call for a return to monumentality, to grand public spaces and futurist plans. When all the best planning calls for ever more private control of space, there will be a call for a return to parks and plazas. These responses are wrong, of course. It’s not a theoretical question. We have tried these before; they failed. What each piece does, though, is reveal a paradox that underlies and destabilizes New Urbanist thought. Hatherley’s claim that Brutalism is the most pedestrian-friendly architecture isn’t empirically true; Brutalism is unpleasant for most pedestrians. This is exacerbated by the movement’s coinciding temporally with an auto-friendly age in terms of planning that conflicted with pro-pedestrian architecture and by the style’s easy lapse into an architecture not of progressivism but of strict social control, which perhaps starts to exonerate the architects themselves. Even so, it is strange, to say the least, that pedestrians are best served by being next to cars. Elevated walkways may not be the answer, but as sustainable transportation advocates push more and more for car-free streets, we turn back to Le Corbusier’s belief that the automobile and the pedestrian must be kept apart. Given that most buildings will still need automobile access—though that might just be for emergencies, deliveries, taxis and carshares—you can imagine a world in which we return to a newer version of elevated walkways due to a movement made explicitly in opposition to Corbusier, Brutalism and the like. A Radburn-type plan, with an entire network of streets behind buildings and another entire network of car-free spaces in front of them, connected by underpasses, seems like it would be very much supported by sustainable transportation types, even as it is a central example of what the New Urbanist city is supposed to reject. This exposes the paradox of making spaces that are not for pedestrians—streets—the centerpoint for pedestrian life. The Radburn Plan with its separated pedestrian and automotive paths. Similarly, Heathcote’s argument reveals the paradox of the public in New Urbanist thought. New Urbanism claims, as part of even its shortest mission statement, to be providing “leadership in community building.” The reconstitution of a public sphere is critically important for everyone working towards traditional neighborhoods; sprawl is consistently (and correctly) accused of isolating and atomizing households. However, the solution is nearly always to increase private control of space. Sometimes this happens at the corporate level. Many of the more suburban New Urbanist developments are entirely privately governed. But even the most laudable New Urbanist projects involve the privatization of space. At the Diggs Town housing project in Norfolk, Virginia, New Urbanist architect Raymond Gindroz took communal lawns and put porches and fences in, turning the lawn into individually controlled yards. Creating this defensible space helped create the safety necessary for community. However, the Disneyfication of our urban spaces is a real problem; Heathcote isn’t wrong to attack the fact that corporations control an inordinate amount of how we experience urban space. The paradox here is that to support the public sphere, we must remove public control, with an additional layer of difficulty in that once ceded, the private sector does not easily give public space back. These paradoxes help me to understand what the planners of the 50’s through 70’s were trying for. Without the historical examples of those periods, if you wanted to create pedestrian environments and promote the public sphere, you too would separate pedestrians from cars and give chunks of land to purely public use. These ideas are even encoded deep within the responses to the planning failures of those decades, because they make a certain kind of sense. We only reject them because we have seen them fail. These paradoxes also serve as a critical reminder that urbanism must remain rooted in empirics rather than ideology. Our current ideology is in the end an incoherent mish-mash, supporting that which it rejects. That’s OK; it helps us muddle towards good projects and good policies. It just means that today’s manifestos should be read very, very skeptically. 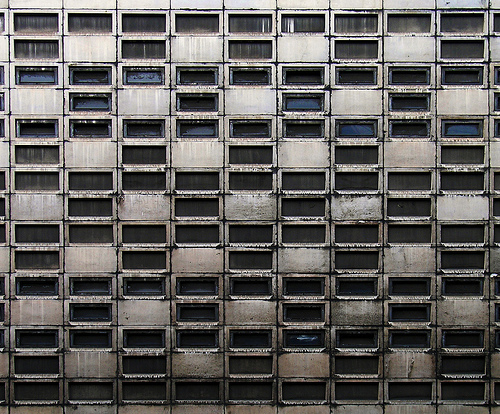 It sometimes takes a blast from the past—someone supporting Brutalism!—to remind us of that. Tags: brutalism, car-free cities, Diggs Town, futurism, Le Corbusier, pedestrians, privatization, Ray Gindroz, Social Impact, traditional neighborhood design, United States, urbanism, urbanization, walkways, Washington, D.C.